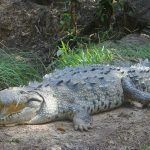 Crocodilians are large carnivorous reptiles of the order Crocodilia, which includes true crocodiles and alligators, in addition to caimans and gharials. Though it is common to refer to all of these different genera and species as crocodiles, ‘crocodilian’ is the more accurate term. 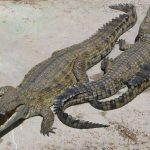 True crocodiles are found in Asia, Africa, the Americas and Australia, and can live in freshwater lakes and rivers as well as saltwater and brackish water habitats. Unlike them, alligators can only live in freshwater habitats, with their distribution range including US and China. Caimans and gharials are also found in both fresh and slight saltwater lakes, marshes, and slow rivers. They are one of the most social reptiles, spending much of their time congregated into groups. 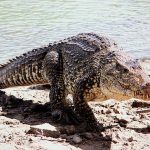 Depending on their size and range, their diet can include small to medium amphibians, fish, crustaceans, reptiles, medium to large mammals, birds, and occasionally even prey on smaller crocodiles. Crocodiles can move around swiftly in the water because of their tail. Their eyes, ears, and snout are located on top of the head to aid them in seeing, smelling and hearing when the rest of the body is submerged in water. This makes them adept at ambush hunting, lying in wait for their prey to come close before making a rushing attack. Large species like the Nile crocodile and American alligator are known to attack humans as well. Most species are polygamous, though monogamy has been reported in American alligators. Mating generally takes place in water, with the female laying eggs in nesting mounds and holes after about a month. The incubation period lasts between 60 and 90 days. Like other reptiles, the surrounding temperature during the incubation period determines whether the hatchlings will be males or females. Crocodilians can live for 35 to 80 years, though it can vary between species. 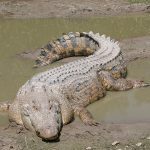 There are multiple records of large crocodiles living for over 100 years. Though they themselves are considered apex predators, smaller species and juveniles may be preyed on by large cats and snakes. Elephants and hippopotamus are also known to have killed crocodiles in self-defense.